An experimental, kaleidoscopic novel about the clash of empires and ideas, told through a tennis match in the sixteenth century between the radical Italian artist Caravaggio and the Spanish poet Francisco de Quevedo. What makes the novel so enthralling is the intimate humanity of its characters. Enrigue demystifies them using a rich, baroque naturalism, cut by flippancy and goofy jokes ... Throughout this mercurial novel, playing fast and loose with facts lets richer truths about the world emerge. ...[a] sublime novel ... dazzlingly vivid scenes, in a dazzlingly vivid translation ... Sudden Death does nothing less than deconstruct and reimagine the origin story of the modern world, and it does so in a way that allows history to breathe and shimmer and shift much like this mantle ... a work so beautiful that it might take your breath away. 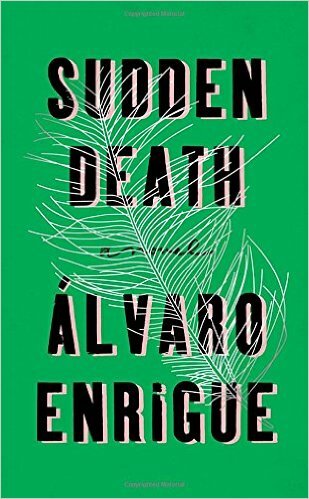 “Sudden Death is a splendid introduction to Mr. Enrigue’s varied body of work, but it also raises a question related to the themes of the novel: Why are English-language readers only now getting a glimpse of what this gifted writer has produced in a career that is already two decades old? What did you think of Sudden Death?